Contractors and architects working with specific guidelines for bathroom accessibility and safety in their commercial construction and remodeling projects come to ORCA HealthCare for ADA shower solutions. Our ADA compliant showers are built for the demands of healthcare facilities, assisted living centers, retirement communities, and dormitories. 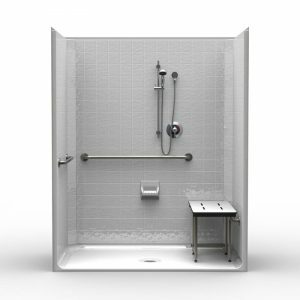 Whether you’re looking to save install time on new construction projects or improve accessibility for retrofits in existing facilities, our ADA showers are built to adhere to regulatory compliance for people with disabilities and maximize long-term value to the building. Manufactured with high quality materials and engineered to exact specifications in the USA, installation of an ADA shower is fast and easy, saving you time and money while ensuring high quality workmanship and a standard 30-year limited warranty. Prefabricated gelcoat fiberglass ADA showers also eliminate the need for any tile work, mitigating the labor cost in time and expertise for tile installation and maintenance issues that are inherent to bathroom tiles over time. 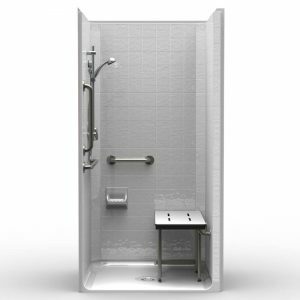 ADA compliant showers are specifically designed for people with limited physical abilities, providing convenient no-threshold step in shower access for wheelchair users with the added safety of non-slip shower pans and heavy duty wall construction. 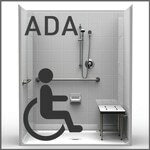 For an ADA shower to meet industry standards set by the Americans with Disabilities Act (ADA), it must respect a certain minimum size and shower pan clearance. 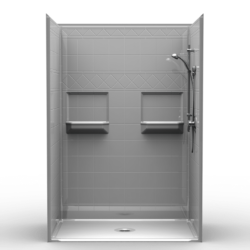 An ADA compliant transfer shower has a minimum interior dimension requirement of 36” x 36” with a maximum ½” curb, whereas an ADA compliant roll-in shower’s requirement is 60” x 30”. A transfer shower or roll-in shower can be installed directly on an existing subfloor, eliminating the need to recess the floor under the shower. 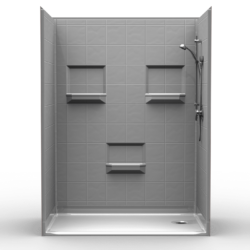 Our ADA transfer and roll-in showers are available as one-piece or multi-piece units. They feature a built-in shower pan designed and engineered for the perfect slope to drain water efficiently. Our one-piece ADA shower unit comes with pre-installed walk-in shower accessories such as a shower seat and grab bars. This ADA shower is ideal for faster deployment on new construction projects, as they only need to be installed and hooked up to the plumbing. Our multi-piece ADA shower unit is perfect for contractors looking to retrofit existing bathroom facilities. It features our innovative leak-proof snap-joint system and plywood backed walls to support installation of a multitude of shower accessories, including shower seats and grab bars for extra measure of safety.